South Korea's Unification Minister Cho Myoung-gyon (R) and Ri Son-gwon (L), chief of North Korean agency in charge of affairs with the South, walk into a meeting room for high-level talks at the truce village of Panmunjom, 29 March 2018. 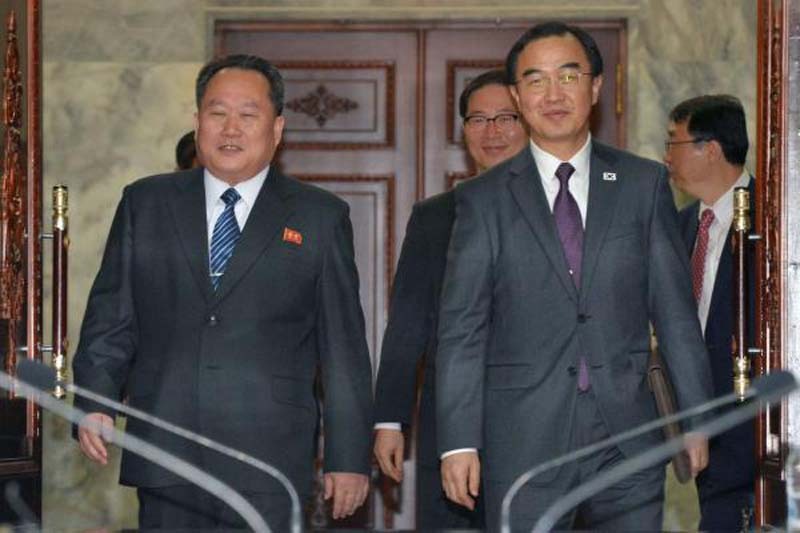 The two sides agreed to hold an inter-Korean summit on 27 April. Photo by Yonhap. With less than a fortnight until the South and North Korea hold their first summit in more than a decade, officials from both sides are expected to wrap up the final details this week. Yonhap reported Sunday that an additional working-level meeting will be held Wednesday at the Tongilgak, a North Korean building at the Panmunjom truce village on the inter-Korean border. After the protocol, security, media coverage and other technical details of the summit are finalized during the talks, a high-level meeting is expected to be held between South Korea's Unification Minister Cho Myoung-gyon and Ri Son-gwon, chairman of the North's agency for inter-Korean affairs, for Wednesday. The presidential official said the high-level meeting will likely be held within the week. Meanwhile, Seoul has announced, "Peace, a New Beginning," will be the slogan for the inter-Korean talks. Presidential spokesman Kim Eui-kyeom told reporters Sunday that the slogan indicates the start of world peace through the first inter-Korean meeting in eleven years, followed by the first-ever summit between the United States and North Korea. The South's organizing committee for the cross-border talks will also launch a web page to post updates on information regarding the summit, in real time, in efforts to initiate public communication and transparency, News 1 reported. The website will be accessible from Tuesday at www.koreasummit.kr.